We took over three of the four machines at the friendly Manzanillo internet café, searching, searching for a path to the sun. We didn’t know how far we could push the Kia in one day, and decided that it made sense to make a stop overnight in the Arenal area, which seemed to have a good selection of hotels. Would any be available? Eureka – Dan struck gold on www.anywhere.com/costa-rica If we were ready to share a “junior suite”, there was a cancellation at four star Mountain Paradise Hotel. The website looked good and the emergency price was right. The website, which works via chat so that the entire interchange can be saved in case of dispute, was having more trouble with Guanacaste. The rains everywhere else had added to the demand. Very little available, and what there was didn’t sound too appealing. Back to VRBO. Six houses/condos were listed as being available for our dates in all of Guanacaste. (There is a very useful tool on the site where you can just plug in your dates and they’ll show you what is showing a vacancy – saves loads of time in a situation like this.) I sent out my emails and within two hours had three responses back. Of these, there was one, “Tres Hermanos”, that looked as though it would fit the bill – walking distance to the protected Playa Junquillal in a gated community; three bedrooms, two full baths, and an intriguing-sounding third floor terrace that boasted views of the mountains and the sea. No reviews, but we took it, fingers crossed. The next morning we saddled up the poor Kia – four adults, four bags and various leftover groceries, all a little heavier for the damp – and set off over what was left of the road to Limon. Back through the cloud forest, and into the mountains. The axels lived through the potholes, we lived through the anxiety (no thanks to you, Avis rent a car) and the GPS held true. We arrived at Mountain Paradise Hotel (www.hotelmountainparadise.com) on a trying-to-be-sunny afternoon. Hummingbirds in the flowering bushes! Friendly helpful staff, happy to book us into the twilight nature walk! Dry sheets! Heated pool with swim-up bar! On-premises spa treatments! Commodious, impeccably clean shower room on a waterfall theme with real vines! Restaurant with what would be a stunning view of the volcano if it weren’t for that pesky cloud! Fifth Dimension and other hits from the 60s and 70s blaring over the restaurant intercom… Well, almost perfect. Over dinner, we missed Chena and Mommie. And, as we tromped on our nature walk leapfrogging half a dozen other tourist groups along the same trails, spotting the same birds, we missed the tranquillity of the Manzanillo jungle, and Omar. The volcano never appeared. We set the GPS and drove off again in the morning, Guanacaste or bust. By noon we arrived at the gates of Tierra Pacifica and were shown the way to Tres Hermanos. Wow. I had somehow not realised that the picture on the web was of just the one house. Large, set apart, and boasting all the modcons. Leather sofas, an indoor shuffleboard table (! ), even a TV. Terraces here, terraces there, and plenty of sun. Landscaped communal pool with classy lounge chairs. Secret back pathway to the beach (key required). If we were looking for a change, we certainly had found it. And never have I seen my family so enthusiastic about laundry – all our disintegrating cottonwear came out for a wash and a stint in the sun, as did we. The development in which Tres Hermanos sits is not all that developed yet. Buildings stood on perhaps 20 of the 73 building sites. Most lots were sold, though. At this point it’s kind of perfect, because there aren’t too many houses, and what was probably once a ranch remains much as it was -- perfect for birding from that third floor terrace. In the morning, there were frigate birds over the water. As the day progressed we watched mangrove blackhawks rising on the thermals, pelicans, orange-chinned parrots, white-throated magpie jays, cedar waxwings in from the States, grosbeaks, flycatchers. There were nesting Inca doves in a palm tree near the front door and rufous-naped wrens squabbling over a site on the back terrace. In the evening kiskadees flocked to the dead tree across the way. One evening, we looked down just before sunset to see two streak-backed orioles snuggled into a gently swaying palm frond, fast asleep. But there this thing about being in a gated community. I guess it comes with the beautiful Italian tile and the modcons, but it made it kind of difficult to feel part of the scene, as we had on the Caribbean coast. I felt safer where I didn’t need a gate, I have to say, especially on New Year’s Eve, when it seemed that some Tico (or at least Spanish speaking) dignitaries were partying in the complex, and the guards were packing some serious-looking firearms. We were warned repeatedly during our stay to watch our belongings, but I never felt personally unsafe in any way, and I think the frequent warnings were partly a function of a very hospitable people who would have been mortified if you lost your mobile phone. Pilfering may be “a fact of life in Central America”, as one of the VRBO owners put it – but you wouldn’t leave your passport lying around at a tourist attraction in London either. Guanacaste is a different scene from the Caribbean coast. There is surfing in both places, but you’d be well-advised to bring your board to the Carribean side. 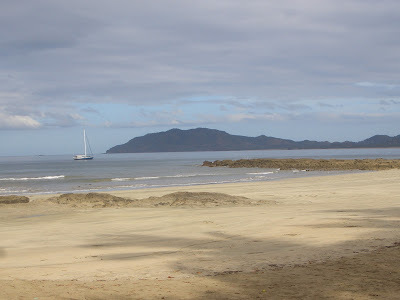 By contrast, if you ever want to learn to surf, you must go to Tamarindo. I don’t know how the waves are, but it must boast the highest concentration of surf schools in the world. If you can’t learn here, take up pinnocle. Tamarindo has all sorts of stuff that Puerto Viejo doesn’t have, like souvenir shops with items you might convince yourself to want, shapely beach bunnies with no tattoos (or at least smaller ones), T shirts that do not mention Bob Marley, an incredible Auto-Mercado with not only tortillas but filo pastry, and the only overpriced and terrible restaurant we encountered in Costa Rica (except at the airport hotel on the way out, which doesn’t count). Needless to say, we missed Puerto Viejo -- although I must say that the entertainment value of the resident iguana at the overpriced and terrible restaurant was worth something. Playa Junqualill is worth a visit, too. It’s a protected white sand beach, and aside from a much-appreciated café and a house or two, there is no building on the shore. (There are a couple of camp grounds, which is how Ticos tend to take in the beach.) Even at the height of the holiday, there were not very many people and by 3 January it was all but deserted. Scuba and snorkelling are available from Tamarindo, although we wouldn’t recommend travelling here for scuba or snorkelling. More real than Tamarindo was nearby Paraiso, which may not offer a lot in ordinary times but over the New Year’s holiday had a fiesta each night featuring a rodeo. On New Year’s Eve, the crowd was buoyant and easy – young couples trying out their moves on the dance floor, kids bouncing on the trampoline, giant grasshoppers flying overhead (thankfully pretty far overhead), and excited descriptions of the ferociousness of the bull and the expertise of the rider issuing from the loudspeaker. In between bull riding were dazzling equestrian displays, complete with rope tricks. Every possible sort of person seemed to be there. It was difficult to tear ourselves away from that upper terrace, which came equipped with a grill, but we did try one restaurant, Villa Deevena, in nearby Playa Negra, which we can wholeheartedly recommend. Lovely continental (European) menu poolside at a pretty little hotel. A few words about San Jose: they’re right that there isn’t a lot to recommend Costa Rica’s capital for the tourist. Very little shopping unless you are interested in a pair of trainers and some new sweatpants – we were told that well-to-do Ticos and westerners shop out in the suburbs at gated malls that have lots of American products. And the architecture is…functional at best. If you are just going to Guanacaste you may want to come fly into Liberia, which is less crowded. That said, we liked Hotel Fleur de Lys (www.fleurdelys.com), which is pretty (lots of old, burnished wood), well-situated for the museums and within walking distance of a good Italian bistro (Roma) and a great Argentine steak house (La Esquina de Buenos Aires). We enjoyed awaiting our children’s arrival on the street-facing terrace. We took in two of the three “must see” San Jose museum:, the Museo Nacional and Museo de Jade Fidel Tristan Castro, which is located at the bottom of the headquarters of Costa Rica’s foremost insurance company, INS (different Fidel Castro). Both have interesting displays of artifacts and a history of Costa Rica from pre-Columbian times. Museo Nacional takes a not entirely optimistic view of recent history as well. If you have time for only one, you may wish to choose on the basis of your political orientation. Museo de Jade gives the capitalist interpretation (“These jade pendants were worn by important persons”) whereas Museo Nacional has a Marxist slant (”These jade pendants were used by the chiefs to distinguish themselves from the workers.”). If, like us, you want to see both with a lunch in between, we recommend the lovely tiled Hotel Don Carlos, which also has a nice terrace looking out on an unusually attractive street. There are taxis everywhere in San Jose, and they are very reasonably priced, so there is no need to have a car. The cash machines here and elsewhere give a choice of colones and dollars, and most businesses accept either – although we can only guess that you are more likely to get the Tico price if you pay in colones. If you do find yourself in San Jose, we found that it was one of the few places that you could get a Costa Rican sim card for your mobile. Try the ICI (national phone company) offices near the cathedral. You will need to take your passport (here or anywhere you try to get a sim card), as they will need to take a photocopy of it. We found having a Costa Rican sim very helpful, although it is much easier to just buy a phone card if you have access to a landline. Will we go back to Costa Rica? Yes, we will definitely be back, and we don’t say that about many places, given how many parts of the world we have yet to see. The luxurious natural beauty and the gracious people really make Costa Rica a special place. We would not, however, recommend going seat-of the-pants without a Spanish speaker on board. People generally speak English about as well as I speak Spanish, which is to say, with a command of a few nouns that are useful in food contexts and limited familiarity with verb tenses. Had the kids not been proficient, the experience would not have been as smooth. If you have a plan to begin with and stick to it, however, I think you would do all right without a lot of Spanish, relying on vociferous hand gestures and the goodwill that you will encounter. We may have some arguments about which coast to return to, and I think we will be consulting the weather maps a little more assiduously next time, but we will be back. In fact, we hear that they have a special “pensioners visa” that might be just the ticket in a year or two…. Go check out http://www.viaam.com/upload/Standard-Suitcase-1684874908.aspx?CatVal=35 We have so many designers, A price for every budget and an amazing selection of bags. You can shop by any size, personal style, product, price and we even have a very cool feature so that you can try the bag on and see if it is right for your height. Awesome post. Very inspiring. I am definitely going to recommend it to a few good friends of mine. The whole write-up has been composed and presented in an excellent way. I thought your perspective on traveling in Costa Rica was refreshing and very helpful. Being a tourist-friendly place, I found it easy to travel there. Your tips go more in-depth and offer another look at Costa Rica. Thanks!